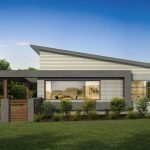 This package created by Ideal Building Solutions Pty Limited has the “Triple S factor” – Style, Sophistication and Sustainability all in the one location and is targeted to those wanting a family home on a great sized block. The block will be completed and ready to start building on during the first half of 2019. The Toorak has been architecturally designed to best use this unusual shaped block. Featuring double glazed windows, all floor coverings, custom joinery to kitchen, laundry, and vanities, blinds, well insulated R 5.0 to ceilings including garage and R 2.0 to all external walls and internal walls of garage, quality SMEG appliances including dishwasher and induction cooktop, 5.5 KW solar PV system, Siebel Eltron 300 litre heat pump for hot water, choice of two stylish front facades, and so much more – see inclusions list attached for further details. 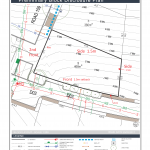 7 Keach Street is in stage 1A of the Strathnairn Development and will be located among other quality homes (close to the new display village) and is located in a quiet street close to parks and the proposed first Neighbourhood Park. has been planned as a sustainable community, the desire to see greater sustainability “built in” to homes, focusing on energy and water efficiency, with all houses to have solar PV panels, Heat pump or Solar hot water and induction cooktops.